Lost In Myth: Does “Knowing” Know Something We Don’t Know About LOST? Something I’ve long been fascinated with is how movies and TV shows with similar themes always seem to come out at the same time. While some of this can be explained by Hollywood’s copycat formula of success stories (vampires are back again thanks to Twilight and True Blood) or current fads (notice the plethora of 3-D films lately—especially in animation? ), what I’m talking about goes a bit deeper. I’m referring to the tendency of certain story themes to come out in very close proximity to one another. It’s as if there’s some kind of new information that humanity is ready to learn that’s buzzing around our collective unconscious. And writers, artists, poets, and even musicians—all being the modern-day shamans that they are—pick up on it and translate it into messages for us mere mortals to subliminally interpret. Then, in the late 90s we had a ton of cities-getting-destroyed movies. There was Independence Day, Armageddon, Deep Impact, and Godzilla for starters. Could this have been some kind of subliminal warning about 9/11? More recently we’ve had disaster films like The Day After Tomorrow, The Happening, and The Day the Earth Stood Still (remake) where nature seems to fight back against humanity. In the wake of An Inconvenient Truth, is this some kind of wake-up call to begin taking better care of the planet? Interesting how all those movies relate to a time, i.e., a “day” or “happening.” The message seems to be that we need to get moving now or face the consequences. Within the last couple years, superpowers movies—either with superheroes or ordinary people gaining super abilities—have been off the charts. Last summer alone, a new superpower film seemed to come out nearly every week. Is this a hint to some kind of new evolution coming for humanity? And what’s with all the time-travel themes lately? This year alone we’ve had the theme creeping into Lost and the new Star Trek movie, and there was also Land of the Lost, and of course another Terminator film. Interestingly though, the theme of the new Terminator didn’t relate to time travel as much as the question over what defines humanity. With technology becoming so advanced, that is an issue we are likely going to have to deal with in the next fifty years if not sooner. My point in bringing all this up is to demonstrate that the similar themes and concepts of movies and TV shows are not just coincidental. There are real messages for us to pay attention to. So after watching Knowing and noting its many similarities to Lost, I began to wonder what the message was and if it could give us a hint about the conclusion of the show, or possibly even what’s to come in the real world. 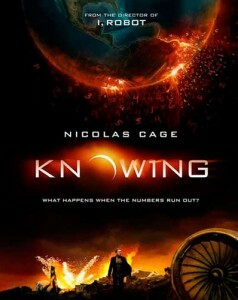 Both Lost and Knowing contain apocalyptic themes. Early on in Lost, it wasn’t particularly obvious, but there were hints. Many fans noted that The HANSO Foundation was an anagram for NOAHS…as in the ark that saved life on earth. In Knowing (I need to give away some spoilers here so stop here if you don’t want ‘em) there were alien crafts that captured all species of life on earth to bring them to safety (I believe this also happened in the remake of The Day the Earth Stood Still as well). Getting back to Lost, there’s also the fact that Oceanic Flight 815 might refer to Genesis 8:15, where God tells Noah to rebuild civilization after the flood. So is the whole point of Lost about saving humanity (or a select group of humans) from the end of the world? Is that where the story is going? While I’m not sure yet if this theme will be contained within the actual story, or just within the moral of the story, the show does seem to be heading in this direction. I spoke a bit about cataclysm theories in The Myth of Lost—especially as they relate to the numbers. What if the numbers are not just a serial number of the Swan Station but a date for the end of the world—4/8/15 at 16:23:42? While this theory has been around for a while, in light of the events of the season five finale, and a very similar use of a sequence of numbers in Knowing, it does give it new weight. 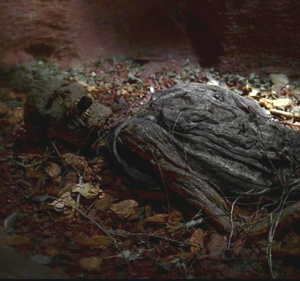 The apocalyptic undertones of season five and Knowing also shed new light on another aspect of the Lost mythology. Early in season one, we see two skeletons referred to as “Adam and Eve.” Surely, this nickname, which seemed like a joke at the time, was no accident. Will the old humanity be destroyed only to bring in a new Adam and Eve to repopulate the world (Aaron and Ji Yeon perhaps)? Is this the point of Lost, or simply another one of its hidden messages about the real world? In Knowing, the Adam and Eve theme is shown almost literally—with a tree of knowledge and everything. This is the Tree of Knowledge of Good and Evil—a theme Lost focuses on quite often. Who is good? Who is evil? What is right? What is wrong? If you look deeper at the Biblical good and evil mythology, it’s not really so much about morality as is commonly interpreted, but about the material world we live in: a world of right and wrong, life and death, up and down, physicality, time, and the senses. These are aspects that did not exist in the Garden of Eden until humanity ate the forbidden fruit. It’s all an allegory for the creation of the physical universe. A world where we can experience ourselves as separate beings who seemingly have the freedom of choice to live life as we want. According to all these media messages however, this world, as we know it may be coming to an end. On the one hand that could mean that the veil between our physical/illusionary world and the infinite world beyond may be thinning. On the other, it can be a warning that our days living on this planet may be numbered. Either way, it would seem that Lost, Knowing, and similar stories are telling us that humanity may be in for drastic changes. We will probably end up stronger when this cleansing is complete, but getting there is going to involve a lot of growing pains for many of us. And those who cannot deal with this new world may not be coming along. Already, we see how the old greedy paradigms are failing, the selfish people are falling, the cheats, liars, and assorted scoundrels are being busted, and those who represent the flashy epitome of ego are dying. Yes, there are certainly a lot of clues out there in stories beyond Lost. But one thing that Lost has taught us is how to look for them. In fact, I think that has been one of the more important purposes of the whole show—to teach us that the clues of the universe are all around us—not just on Lost. As we move ever closer to Lost’s final episodes, that knowledge is reassuring indeed. The search for clues will not end with Lost. Regardless of its solution, the show has opened our eyes to a whole new beginning.